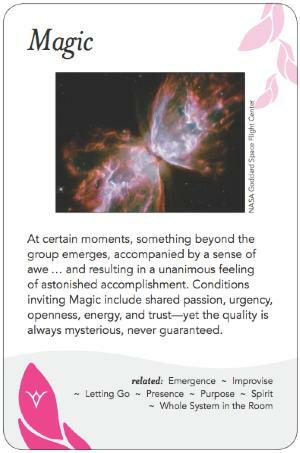 At certain moments, something beyond the group emerges, accompanied by a sense of awe . . . and resulting in a unanimous feeling of astonished accomplishment. Conditions inviting Magic include shared passion, urgency, openness, energy and trust--yet the quality is always mysterious, never guaranteed. Participants are not always sure why it happens. You can plan for it all you want and you may not get it, or it can sometimes emerge with no planning whatsoever. After it occurs, people are likely to have a variety of theories of what led to it. The most unified thing about it is that usually, when it's present, people will agree right afterward that it was--even if they call it different things! The experience of what we are here calling "Magic" is signaled by creativity, joy, synergy, and a sense of moving toward Purpose. Similar to what some athletes call being "in the zone" or what Csíkszentmihályi called "flow," it is deeply satisfying and often comes with a sense of fulfillment at being well-used, doing what you are supposed to be doing and doing it well. Solid container, including focused time without interruption or distraction. Magic is thus reliant on a bunch of the other patterns in the pattern language, and it might be what you get when you apply them well, plus get lucky. The result is a whole that is greater than the sum of the parts contributed by each participant. Magic is very intuitive, improvisational, and spontaneous. It emerges from the collective energy of the group. It just happens; no one is in control of the process and no one can control it. To create an environment for magic you must first clear the space and create a new space. Each must come with intention and presence. Participants must be prepared to appreciate and surrender to the collective intention (from Latin "stretching toward") of the meeting and channel the magic that is happening. It may help to use ceremony, ritual, scents, love offerings, other means of deepening the connection among the participants and connection to all life, the larger context. It requires an unconditional acceptance and lack of judgment from the participants and creating a safe container that allows participants to be vulnerable and share vulnerable feelings and ideas. Everyone must be willing to listen to and respect the opinions and ideas of all others, or the magic will be broken. There must be a gradual building of trust, and a chance to react to what is happening and to engage fully in the process. Different cultures have different names for it. Christians often call it Grace, while neo-Pagans might call it Gaia working through us. Between them, they name the following conditions associated with it: spiritual preparation--some individuals need already, upon entering the meeting, to be immersed in the spirit of worship; how close people sit together; time without interruption, no one arriving late or leaving early; spoken words characterized by brevity, earnest sincerity, and frequently a lack of polish. “The speed of organization and the substantial nature of the results are indeed a surprise, but even more surprising are the manifest behaviors evidenced by the group. Without prior instruction, indeed without even mentioning the words, Self-managed Work Groups appeared as the modus operandi. Effective leadership manifest where needed without prior designation. Diversity of opinion was not only tolerated, but honored as the rich seed bed of new opportunity. This diverse group of what in other situations were often hostile and suspicious competitors, became (apparently without intention or effort) something that looked an awful lot like a truly supportive community which not only worked hard to accomplish much, but also had fun doing all that. And through it all, the facilitators never intervened, no manager or executive called the group to task, or struggled to keep them on time and in order. Everything just happened by itself.